Swastikas sprayed on Redditch Central Mosque walls A mosque being built in Worcestershire has been broken into and graffiti including swastikas sprayed on to the walls and windows. "> A mosque being built in Worcestershire has been broken into and graffiti including swastikas sprayed on to the walls and windows. A mosque being built in Worcestershire has been broken into and graffiti including swastikas sprayed on to the walls and windows. The damage at the mosque in Jinnah Road, Redditch, was caused between 02:00 BST and 04:30. Graffiti was sprayed over at least six windows. The intruders forced their way through a gate and broke into the main building. Police believe the motive for the attack was to steal building equipment. A spokesperson said about £1,000 worth of equipment was taken and the paint used to daub the swastikas was stolen from the building. Officers had increased patrols in the area and were guarding the site. Supt Kevin Purcell, of West Mercia Police, said because of incidents "happening nationally", targeted patrols had been put in place at the mosque, which has been under construction for several years. He said they would now be "further increased" and police would not "tolerate mindless attacks of this nature". Forensics experts are currently at the site, in the Smallwood area of the town. 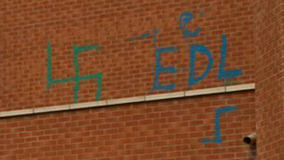 Police said they believed the aerosol paint cans used by the vandals had been taken from builders' cabins on the site. BBC WM reporter Michelle Dawes, who was at the scene, said swastikas had been sprayed in blue paint, along with the initials EDL, NF, KKK and racist language. The £2.5m mosque, which will be known as the Redditch Central Mosque once opened, has previously been hit by vandalism. At the time of those attacks two years ago, they were not thought to be racially motivated. The new building will measure more than 1,000 sq m (10,760 sq ft) and will have room for about 1,300 worshippers. It will replace the current mosque in Easemore Road. Mosque leaders said they were "shocked" at the attack. Treasurer Mobeen Al-Hussain said they believed the intruders had broken in to steal some drainage equipment being used by the construction workers and had painted the graffiti after finding the spray cans. He said the break-in would not delay the building work any further. "It is sad but as a project it's not going to hinder our next phase. We're hoping to have some part of this mosque running by the end of the year, if not fully operational," he said. Work has already started to remove the graffiti. Mr Purcell added: "For as long as I can remember the relationship between the Muslim community in Redditch, the police and the wider community would best be described as excellent." He said he would be arranging meetings with the chairs of the mosques and civic leaders to "reassure them of our commitment and determination to do everything possible to prevent any further such incidents and track down those responsible for this attack".